Certain diseases, such as osteoporosis or cancer, are known to cause loss of bone mass and changes in bone structure, making them brittle and weak. Genetic factors and certain lifestyles, such as a low calcium diet, can also damage bone. Over time, the vertebral bodies can become so weak that normal activities such as bending over or lifting a bag of groceries, can cause a spinal fracture. You can’t feel the changes in your bones while they are happening; in fact, many people are unaware that there is anything wrong until a fracture occurs. When more than one spinal fracture occurs, loss of height or spinal deformities such as a dowager’s hump may result. Even though most osteoporotic spinal fractures are typically a stable injury, in many cases they cause debilitating pain and reduce the quality of life for those who suffer from them. In recent years, the treatment of osteoporotic fractures has advanced considerably with the development of the surgical procedure known as Balloon Kyphoplasty. With Balloon Kyphoplasty, an orthopedic balloon is used to elevate the bone fragments of the fractured vertebra and return them to the correct position. The incision site is approximately 1 cm in length. A hollow instrument is used to guide the balloon into the vertebra. 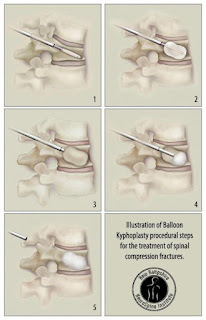 The balloon is then inflated so that the collapsed vertebra is returned to its normal position. Once the vertebra is in the correct position, the balloon is deflated, leaving a space for bone cement. The cement stabilizes the fracture and holds the vertebra in place. The Kyphoplasty is minimally invasive. It is typically done in an outpatient setting at a hospital or surgery center. As with any procedure, there are potential risks and the procedure is not for everyone. The New Hamshire NeuroSpine Institute is unique in our approach to compression fractures as we have a team of experts to work together in addressing our patients’ problems. Our team of professionals may look at the underlying cause of the problem (through our Osteoporosis Clinic), utilize therapies such as PT and Bracing in cooperation with our Physical Therapists and if indicated, a surgical consultation might be arranged with one of our physicians trained in Balloon Kyphoplasty.